The enterprise app to manage safety on construction sites. Sub-contractors can submit data from mobile devices and are notified when actions or the validation of actions is required. Safety officers can conduct safety inspections and validate PTWs instantly. Corrective actions are easy to check and monitor. Site managers can monitor the status of all PTWs and NCRs in real time. Novade Safety is a formidable platform to improve safety project after project. By capturing data day after day, you can analyse data, identify trends, draw correlations and ultimately improve safety on projects. Real-time access to information on mobile devices & automatic generation of reports. Rule-based system ensures rigorous enforcement and control on key processes. Teams can assess issues, take corrective actions and ultimately improve safety. Digital forms for permit to work (PTW) such as hot work, lifting, work at height, etc. Customize workflows for each PTW. Submit, review and approve PTWs directly from mobile devices. Sign off digitally on forms. Monitor the status of all PTWs in real time. Archive PDFs for easy retrieval automatically. Lodge non-conformities during inspections: select standard description, take picture, annotate the picture. Assign corrective actions on the spot with starting data, completion and level of severity. Confirm completion of corrective actions and get acknowledgement with digital signature. Customize Digital forms to match your Incident, Accident or Near Miss reports. Input information in the field from mobile devices: hazard, hazard source, root cause. Review information: Identify corrective and preventive actions. Conducts analytics: frequency, most common sources, correlations. Digitize meeting reports: this includes toolbox meetings, incident & risk-assessment reviews, weekly safety meetings, and more. Simplify the attendee confirmation process. Track workers’ attendance for each meeting. Review all the meetings conducted on the project at a glance. Attach files to each meeting. 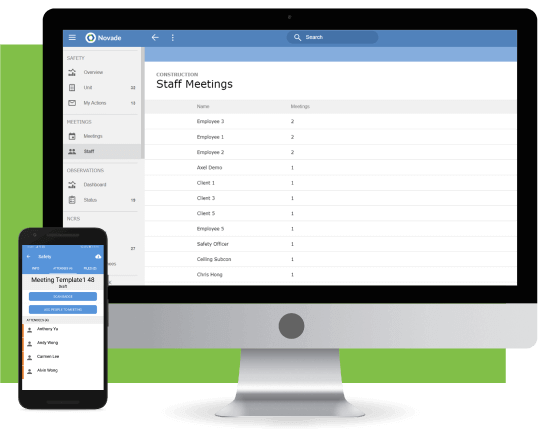 Generate meeting reports in PDF format.